Favorite food: How about my dislikes? Favorite toy: My stuffed lobsters. Favorite activity: Going to see Cookie Gramma and lounging. Eating would also be a TOP priority. Special talents: I sing opera. Most embarrassing moment: After my knee surgery I had a few accidents. Most trouble I ever got into: Found some reserved energy, bolted out the front door and down the road. 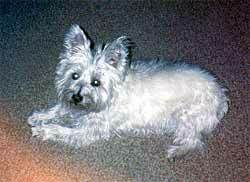 My favorite friends: Heidi the Schnauzer, Skeeter the Westie and Maggie the pound Terrier. Biggest adventure: Being rescued by my mum Cathy and putting up with Johnnymac on a daily basis.